The right tools are a necessity, but how you use them as enablers will determine success. Omnichannel Is Everywhere—Vendor Marketing, Analyst Articles, Conference Sessions, Client Wish Lists. While touted as a new concept, it doesn’t seem all that different from the multimedia routing and reporting (MMRR) or multichannel efforts that have been around for years and have proven so difficult to achieve. So it’s fair to ask: What has changed (other than the label) that will enable customers to use their channel of choice and allow effective management of service and sales across all media? In this article, we will explore changes in the market, emerging tools and how the tools work together. We’ll also discuss critical success factors to pursue the elusive omnichannel goal. Omnichannel has replaced multichannel (or multimedia) as the buzzword used by vendors, analysts and contact centers. The end-state goal has also changed; this shift reflects a first step in overcoming barriers to successful deployment. Multichannel referred to customers being offered the ability to contact a company through the traditional voice channel along with email and chat from the website, and fax, text, mail or other channels as appropriate. The different channels were often enabled by different tools that were owned by different parts of the organization—the contact center owned voice, while departments like IT, marketing and digital channels owned others. Multichannel wasn’t intended to be segmented; it just worked out that way given a myriad of challenges and organizational realities. From a contact center perspective, the intent was to route in the same (multimedia) “automatic call distribution” system (or ACD) for efficient management of staff using consistent reporting and a consolidated view of workload and production. However, it evolved to managing contacts in the same siloed way as the organizational ownership, typically handled by dedicated staff per channel, with limited analysis for efficient operations. Omnichannel aspires to achieve a “seamless, integrated customer experience,” not just offer a bunch of channels. It contemplates cross-channel interaction with seamless movement from one to another (e.g., mobile app to phone call; web self- service to phone call (“call me”) or chat session; self-service kiosks to video-assisted service on the kiosk from a branch or retail store). A seamless customer experience demands great processes and tools, including the ability to track each customer’s progress through identification and authentication, transactions attempted, web pages visited, and other channels used prior to selecting an assisted service channel. It means that the staff offering assisted service must have visibility into the progress of the current contact as well as the customer’s account and contact history. Omnichannel also requires an expanded use of data through application integration and tracking with all current and historical data visible to the agent. Integration of data and tools is a critical success factor to achieving an omnichannel goal. ACD and CRM solutions have been around for decades with varying abilities to achieve multimedia routing and reporting. Vendors offer critical functions for delivering a “seamless, integrated customer experience” across channels, but few companies have gotten very far in bringing them together across departments and customer touchpoints. With improvements in both sets of tools, the market is evolving to support omnichannel’s lofty goals. Traditional solutions have been expanding their capabilities. For years, most ACD agent interfaces allowed for managing contacts across media routed by the ACD (e.g., login, manage workstates, see contacts in queue). The move to omnichannel brings new focus to emerging customer interaction channels like text/SMS and seeks to extend skills, conditional routing, and other core tools to these media. CRM plays an obvious role in achieving omnichannel as it typically becomes the agent’s transaction interface and the source of much of the customer profile and contact history. CRM can route and report on channels other than voice (typically email, chat and social media, and now moving into text/SMS), and some vendors support voice through built-in capabilities, acquisitions or partnerships. Customer Engagement Hub (CEH) is a term gaining traction and used by Gartner to describe the functionality to “pull it all together” for omnichannel success. Some CRM vendors, such as Pegasystems, are specifically evolving their CRM interface and functions to perform these functions. ACD vendors, such as Avaya (Oceana) and Genesys (Customer Experience Platform) are expanding their interface and functions to fill the need. However, there is also a new breed of vendors that offer the hub functionality, acknowledging the investment in technology already made and the operations disruption involved in technology replacement. CEH vendors offer solutions that provide “easy” integration across websites, mobile apps, email servers, social media, advertising and campaign management, ERP, CRM, contact center technology and knowledge aids (externally and internally focused). They support functions such as real-time monitoring and context of customer journeys, single desktop interface, process building and automation, data and application connectivity and integration, and dashboards and analytics. They drive more customer-centric and dynamic proactive outbound communication, flexible self-service, concierge-assisted service, and detailed analytics of the customer experiences for conclusions. They integrate data collected at all customer touchpoints, including self- service, assisted service, store visits and websites. CEHs provide the contact center agent interface for consistent delivery of contacts across all media within the same window with full context of the customer history and current experience as well as integration for knowledge aids. Reporting can still be the challenge, as in many of the other options. Contact center vendors are responding to the CEH requirement for omnichannel. A few vendors (previously mentioned) offer a multimedia ACD with customer experience platform or customer engagement hub included. This solution delivers an omnichannel desktop workspace for the agent with a consistent user interface across channels. The solution enables integration to other data sources for customer history, account details, knowledge aids, etc., and embeds CRM for additional data and transacting. The ACD with CEH is attempting to resolve the routing functionality confusion by keeping routing in the ACD. Enhanced functionality such as dynamic tool bars that change depending on channel, email and chat management functionality (e.g., spell check, templates, etc. ), and full visibility into the current interaction journey across all channels is added. Cloud ACD solutions that focus on voice only are also getting into the omnichannel game. Their value propositions emphasize simplicity: simple to buy, implement, use and support. These solutions rely on others to deliver the full omnichannel experience. These vendors typically partner with the biggest CRM solution providers, such as Salesforce.com, Microsoft Dynamics and ZenDesk, for multimedia routing and access to information. From what we’ve seen so far, reporting and other functions aren’t comparable to what we’re used to in the voice world, but they have a different focus—fast, easy, low cost. The data is there, but analysts will have to create integrated reporting that delivers what contact center managers need for efficient operations and decision making across channels, and likely across platforms. The market is filled with acquisitions and partnerships to resolve the confusion inherent in achieving the omnichannel goal. Whether these tools can gain traction remains to be seen. Traditional solutions have had years to get it right and arguably weren’t able to solve the difficult challenges. The relabeling of multichannel to omnichannel and emphasis across a wide spectrum of vendors won’t solve the challenges either. Many critical success factors fall outside the realm of technology. However a contact center approaches omnichannel, performance tools must be considered to ensure contact center management can achieve efficient and effective multimedia operations. WFM: In order to forecast, staff and schedule, data from all media must be included in staffing analysis, including volumes and handling times. RM, when used for routing, can timestamp events, but the configuration must be detailed enough to reveal actual handle times. Whether in CRM or and ACD, the data must account for multiple contact handling. Voice of the Customer: Surveys should be completed for all media. Reporting and analytics: Ensure omnichannel data is structured in a way that reveals the insights required for effective and efficient management. Enterprises will not achieve an omnichannel customer experience with tools alone. Strategy comes first, followed by the process, integration and organizational elements to drive value from the technology and deliver on the goals. Four sets of actions create momentum for future success. 1. CREATE AN ENTERPRISE CROSSFUNCTIONAL TEAM that includes the contact center, IT, marketing, other channel owners, etc.— anyone that touches the customer experience. The team will probably require high-level sponsorship to get started. The team should define the end-state goal and ensure buy-in at all levels of the organization and within all silos. Define the current state, gaps and projects. Then pursue approval, including funding and resources. Channel selection—allow customers to select contact media appropriate to their channel of choice and pass data along with contacts in all media—even as they cross channels. Identification and verification—adjust the ID&V process based on channel and transaction risk; leverage and pass data. Routing—implement conditional and data directed routing based on data passed with contact and customer profile and interaction history. Contact handling—guide the interaction with business rules and workflows based on data passed with contact and customer history; create a custom experience. Follow-up and escalation—use business rules and workflows that leverage data to guide and track the next task. 3. 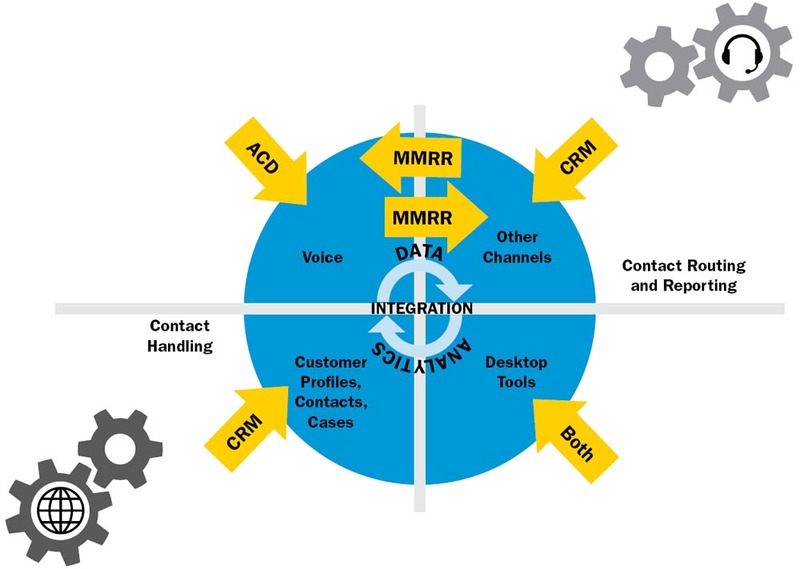 TREAT MMRR, CRM, KNOWLEDGE MANAGEMENT (KM) AND ANALYTICS AS OMNICHANNEL PILLARS THAT MUST BE INTEGRATED. While MMRR and CRM address the customer interaction, a single KM provides a common source of answers, whether self-service or assisted service. Analytics assesses performance and identifies actions from insights. Ensure that the integration and data strategy achieves the reporting required to track the customer experience as well as the efficiency of operations. 4. MANAGE PERFORMANCE FOR ALL CHANNELS. Define metrics for non-voice media and how that data will be captured and used for staff planning and decision making (see “Moving Beyond Phone Calls: WFM in an Omnichannel World,” Pipeline, December 2016). Ensure that recruiting, hiring and training covers all the skills required to handle all media. Close the loop with quality reviews, voice of the customer, and feedback and coaching across media. The right tools are a necessity in achieving an omnichannel experience. Various tools claim to be “the way,” but you will likely need a combination of technologies along with integration to find your way. Appropriate due diligence based on your defined needs, existing technology infrastructure, resources and other factors will guide you toward the right solution(s). However, while a technology strategy is crucial, as with so many other things, how you use the tools as enablers to achieving your omnichannel vision will determine your success.